1. Cut the broccoli and carrot. Put black fungus in water for 10 minutes. 2. Put all these three ingredients into one plate. 3. Add some water, cooking oil and salt into a pan. After the water boils, put step 3 ingredients inside. Remove until the water boils again. 4. 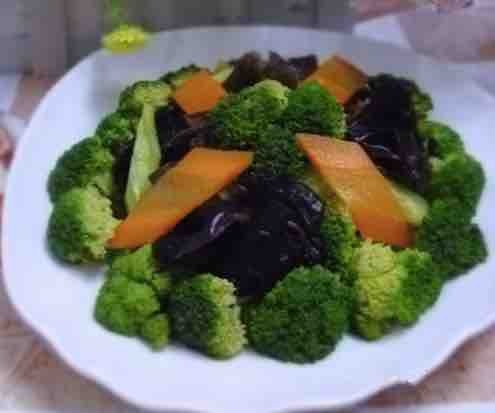 Mix the vegetables with garlic, salt, soy sauce, vinegar, sugar, chicken powder and sesame oil. 5. Mix well and enjoy! 1. If you don’t have enough time, you can use warm water to soak the black fungus. 2. When boil the vegetables, adding a little cooking oil and salt can help preserve the fresh color of the vegetables. 3. Feel free to adjust the amount of spices according to your own taste. 4. Don’t boil the vegetables for too long.